The Central Admissions office gives you a single point of contact for easier admission to one of our skilled-nursing facilities. Our highly-trained admissions staff help physicians, family members, discharge planners and others identify the Vanguard facility which will best meet an individual’s needs. 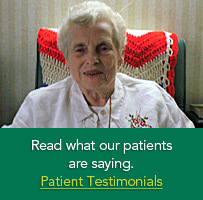 We highly recommend touring a facility to explore how well it meets your needs or those of your loved one. The Admissions Team is here to offer assistance with any questions you may have about our skilled-nursing facilities and services. To learn more about our facilities and their services, or to arrange a personal tour, please contact Central Admissions at 1-855-66ADMIT (662-3648). Our Centralized Admissions will be your guide during the check-in process. In addition, the admissions coordinator will be with you every step of the way, helping you complete admissions paperwork, getting your loved one into a room and answering your questions about meals, activities and other services. Within 72 hours, you will receive a personal care plan developed by our interdisciplinary team along with a guide how care will be provided. This plan will be monitored and modified as necessary throughout the resident’s stay, whether long- or short-term. Family and caregivers’ involvement in this process is highly recommended. Copyright 2012. Vanguard Healthcare Services, Inc. All rights reserved.